Is Phil Daniels' design a MagicEye? Designer boxes - can you guess which one is by an actor? 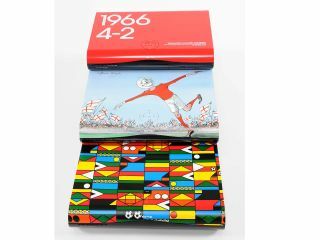 Sky has released a trio of new designer HD boxes to celebrate this summer's World Cup, with Wayne Hemingway, Gerald Scarfe and Phil Daniels' version all available on 26 May. The boxes, which will no doubt divide opinions, bring designs from fashion man Hemingway, illustrator Scarfe and, oddly, actor Phil Daniels. "To mark the World Cup being broadcast live and in high definition this year, Sky has joined forces with three famous faces to produce a limited edition collection of football themed Sky+HD 1TB boxes," explains Sky. "The exclusive designs are a must have for any football enthusiast looking to soak up every detail of World Cup drama," it adds. Of course, Sky's celebrated sports channels will not be broadcasting the World Cup, but the company is still keen to show off its leading role in high definition broadcasts in the UK. Sky has both ITV HD and BBC HD, which means that Sky HD subscribers will get the high definition matches, potentially on a shiny new designer box. If we had to choose, we'd go for Hemingway's low-key effort, utilising the score, kit colour and year of England's World Cup win. However, we're relatively certain that Phil Daniels' career as a designer may not be especially lengthy. Stick to the day-job Phil. The boxes are out on 26 May, priced at £249.